Montessori Mondays – Ursuline Academy – Celebrating 125 Years! Did you know that Ursuline has a co-ed Early Childhood Montessori program? 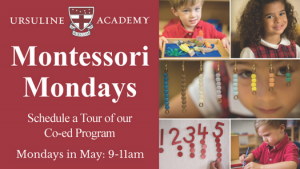 On May 7th, 14th and 21st, you are invited to join us for a special tour of our Montessori classrooms. Come see for yourself why this extraordinary program has been a part of our Lower School for over 50 years! To register for a Montessori Monday tour, please contact Jenna Jackson at (302) 658-7158 ext. 210 or jjackson@ursuline.org. Walk-ins are also welcome! Tour times are 9-11am. We look forward to meeting you soon!